Apart from a flourishing film career, the actor sang in Hindi and Nepali. When Tshering Phintso Denzongpa was auditioning for roles in the 1970s, the Film and Television Institute of Indian alumnus was told that he looked too exotic for Hindi cinema. The Sikkimese actor had already changed his first name to Danny, on the recommendation of his FTII classmate Jaya Bachchan, but he was an oddity in a world that was and still is hostile towards actors from the North-east. Denzongpa started out with bit parts in Gulzar’s Mere Apne (1971) and Zaroorat (1972) before his break-out performance in BR Chopra’s Dhund (1973). Over the next three decades, Denzongpa played innumerable roles, including the iconic gangster Kancha Cheena in Mukul Anand’s Agneepath (1990), a role that was reprised by Sanjay Dutt in the 2012 remake. The singing break came in the form of bait for a role. In Yeh Gulistan Hamara (1972), Denzongpa was initially cast as a Naga rebel, but the part went to Sujit Kumar. The movie’s director, Atma Ram, offered Denzongpa the role of a servant, tempting him with the added bonus of a song. Denzongpa recorded the duet “Mera Paas Aao” with Lata Mangeshkar for music composer Sachin Dev Burman, but he lost out on the role to Johnny Walker. Atma Ram wanted to dub Denzongpa’s song with Manna Dey, but Burman insisted that Walker be filmed in Denzongpa’s voice. ‘Mera Paas Aao’ from ‘Yeh Gulistan Hamara’. The slurring accent is meant to be a parody of how people from the North-east sound when they sing in Hindi. The track was dropped from the movie after protests by members of the Ao community from Nagaland, which seems to have been the inspiration for the unnamed tribe depicted in the plot. Whatever the circumstances, Denzongpa’s brief singing career had kicked off. He was born in Sikkim in 1948 into a family of horse breeders. He played the flute and could hold a note while shepherding horses through the valley. When Denzongpa enrolled at FTII for the acting course, music was part of the curriculum. The opportunity to sing came again in Kala Sona (1975) under the baton of Rahul Dev Burman. In “Sun Sun Kasam Se”, written by Majrooh Sultanpuri, Denzongpa’s co-singer was Asha Bhosle, with whom he would later collaborate for Nepali songs. The song was immensely popular, but Denzongpa wasn’t exactly flooded with singing offers. ‘Suno Suno Kasam Se’ from ‘Kala Sona’. In Mahesh Bhatt’s Naya Daur (1978), Denzongpa sang with Kishore Kumar and Mohammed Rafi. 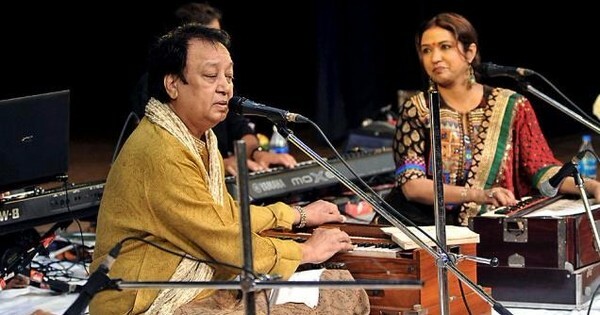 He did not get behind a microphone again until 1985, when Nadeem-Shravan released the album Star Ten in which actors like Anil Kapoor, Jackie Shroff, Mithun Chakraborty, Sachin and Danny Denzongpa sang songs alongside actresses like Kajal Kiran, Kalpana and Vijayta Pandit. ‘Yun Dhoop Mein Na Jao’ from ‘Star Ten’. Denzongpa’s intermittent singing career included the record Nazm, Geet and Ghazal under the EMI music label in 1979. In “Bagair Ishq Ke”, Denzongpa announces that he will pursue ghazal singing as a career. He sings from his heart, but the texture of his sonorous voice does not quite compliment the form. Nazm, Geet and Ghazal remains Denzongpa’s only excursion into the territory. Although Denzongpa’s Hindi film playback career did not take off, his fall-back option in the language in which he is fluent worked. Denzongpa has given voice to several hit Nepali songs. Watching him dance around Asha Bhosle in “Aage Aage Topai Ko Gola,” one of those rare occasions on which the disciplined actor lets his floppy hair down. ‘Aage Aage Topai Ko Gola’.